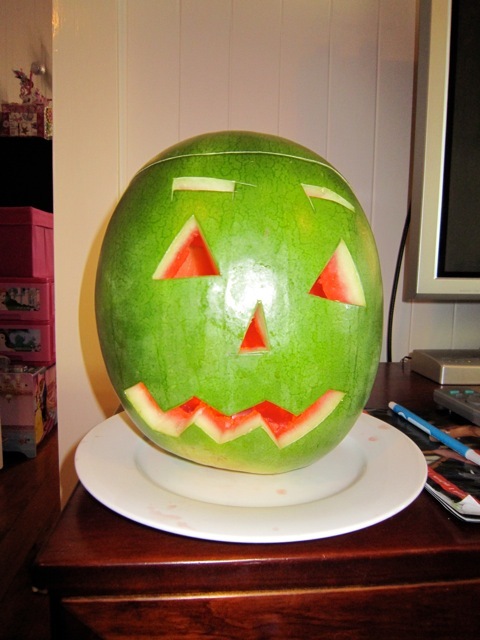 Home > Australia, Business, Craft	> Craft: Halloween watermelon, Queensland-style! 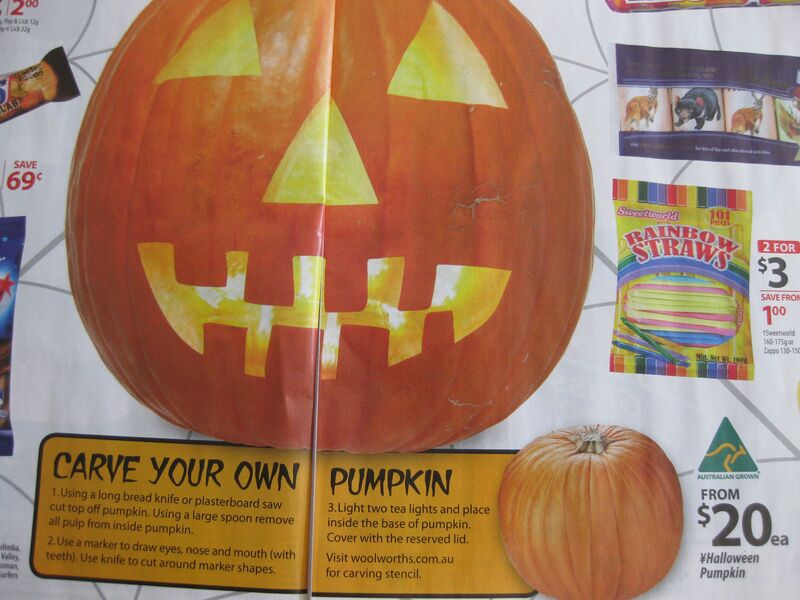 In time for Halloween, Yours Truly reviewed the traditional pumpkin for its carving qualities. Because Auntie and I like value for money as much as the next person, we’ve decided to share with you our secret for next year. Instead of fully participating in the overpriced pumpkin rort, we’re going to do it Queensland-style, using watermelons! Aussie watermelon beats American pumpkin! 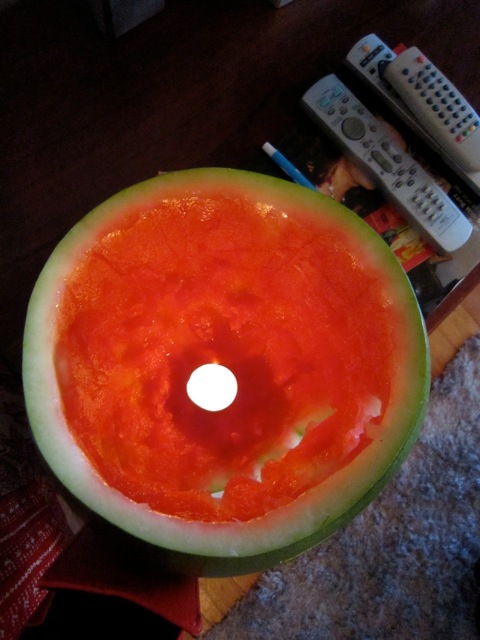 Can we paint the watermelon orange after you have removed all the juicy fruit inside or is that going a little too far? Jacqueline, if you can recommend a paint that will stick to said watermelon, I shall fearlessly endeavour to treat the watermelon to an orange suntan. Otherwise, Auntie and I are starting our own Halloween tradition with green non-pumpkin lanterns. (She had a hard time convincing her kids that they were really green pumpkins that tasted like watermelon). By the way, I roasted the pumpkin and it was inedible, it tasted that bad. Even the chooks thought so. That would explain why the fruit markets dumped 400 of these pumpkins the day after Halloween – they’re no good for anything else. On the other hand, we can eat the insides of any given watermelon until our own insides burst, and still do it for well under the $20 pumpkin price tag! 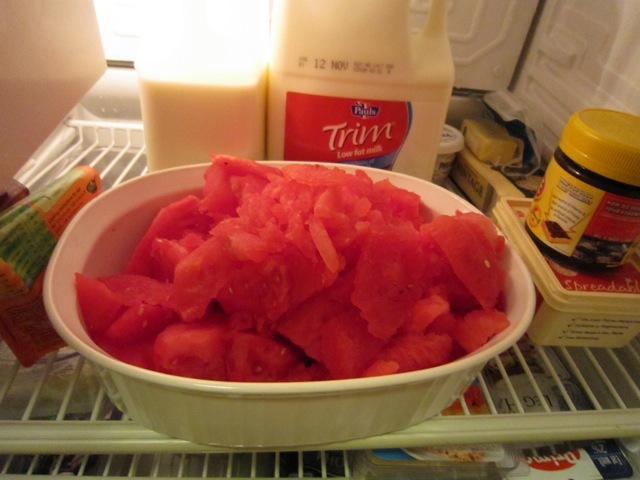 Hurray for watermelons! I think starting the watermelon tradition is a much better idea than painting it orange…I’ll try and spread it in my suburb too next year. Considering the lantern began as a turnip in Scotland and Ireland and became a pumpkin in America. I think in Australia it should become a watermelon! Well done guys!! Thanks for the cheer, Jacqueline. It makes Auntie and I braver, to take on new challenges and projects! I look forward to seeing lots of Halloween watermelons next year.